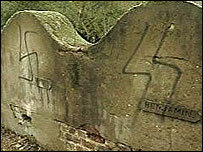 Police are once again hunting vandals who defaced a Jewish cemetery by spraying graves with Nazi graffiti. Ten gravestones, some with headstones that mark war graves, have been daubed with swastikas and other insignia. In November, 15 gravestones were defaced in an attack at the cemetery in Redan Road in Aldershot, Hampshire. A police spokesman said: "It is despicable that vandals attack Jewish graves so close to the Holocaust Memorial Day."